Product review: This is an amazing experience – by Jim H From Winchester, 13 Aug 14 5/5 Excellent "Arranging the date was easy - we called up, and they booked us in! We could have gone at the weekend but this centre operates all week so we went on Tuesday The venue and its facilities were also very easy to find; the facilities were good, clean and tidy. There was a coffee machine and plenty of room for the kids to play. Staff were really friendly. We were warmly welcomed and Judy, the pilot and world champion, was very very nice. The equipment seemed well maintained, and the Briefing gave me plenty of confidence. You can't even begin to describe the Experience itself. It was absolutely amazing, I have never smiled so much in all my life! I would reccomend anyone to do it; in fact, I'm going back for more, to do my pilots qualification! The video they did was good to show the boys in the office. " 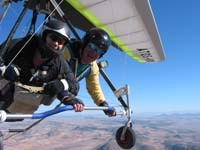 You will fly in a purpose built tandem hang glider, with multiple world record holder and twice World Champion Hang Gliding pilot, Judy Leden. With many thousands of flights to her credit (and an MBE awarded for "sevices to hang gliding"), Judy is probably the most experienced tandem Hang glider pilot in the country. She will take you through a comprehensive briefing before you are towed aloft behind a powerful tug aircraft towards the base of the clouds. You will be in the Hang Glider for between 25 and 45 minutes, depending on the weather conditions. Once aloft you can have a go at flying the glider or simply enjoy incredible views over Derbyshire's Peak District. This magical sensation really is the closest you will come to flying like a bird. At the end of your experience you can purchase a signed copy of Judy's book 'Flying With Condors'. This really does top off the experience of a lifetime. Better still, if you liked your flight and want more, you have the option of using this experience towards gaining your British Hang gliding and Paragliding Association Hang Gliding pilot qualification at a reduced rate. Max weight 14.5 stone and weight in proportion to height. Please specify at the time of booking that your flight is to be with Judy Leden. This experience is suitable for people with a wide range of disabilities in both lower and upper body. This centre operates throughout the year at weekends and on weekdays. Arranging the date was easy - we called up, and they booked us in! We could have gone at the weekend but this centre operates all week so we went on Tuesday The venue and its facilities were also very easy to find; the facilities were good, clean and tidy. There was a coffee machine and plenty of room for the kids to play. Staff were really friendly. We were warmly welcomed and Judy, the pilot and world champion, was very very nice. The equipment seemed well maintained, and the Briefing gave me plenty of confidence. You can't even begin to describe the Experience itself. It was absolutely amazing, I have never smiled so much in all my life! I would reccomend anyone to do it; in fact, I'm going back for more, to do my pilots qualification! The video they did was good to show the boys in the office.